PIONEER Computers Australia has released a second model to add to its DreamBook Light IL series, the DreamBook Light IL2 (I’d Love too or I’d Love 2). The DreamBook Light IL2 is available at a low cost. Featuring 8 inch high clear digital LCD display on a swivel base, 32 bit, 400MHz high speed fan less processor and 4GB Nand Flash Disk Build in, up to 32G optional SD / USB disk, the DreamBook Light IL2 runs on Microsoft Windows Compact Edition or Linux. There is a touch screen option available. Dimensions are 225 x 165 x 30mm (with keyboard) and weighing just 800g (with keyboard), the DreamBook Light IL2 is light, compact and easy to carry. With lithium battery 2000mAh 7.4 V (equal 3.7V 3000MAh), DreamBook Light IL2 has up to 4 hours of battery life. The DreamBook Light IL2 is targeted at the education market. DreamBook Light IL2 comes with a host of education features such as video teaching to go along with up to date text books and animation learning, authorised dictionaries installed, including the Longman English Dictionary and mutual bilingual translation for words, sentences and paragraphs. Communication tools include web surfing, messenger and skype. DreamBook Light IL2 supports office software such as word and excel. 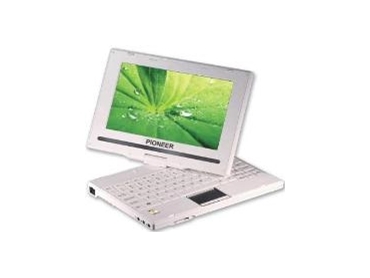 The portable computer can also be used as media player to play movies and music. In addition, there is a built-in games simulator that supports hundreds of computer games. The DreamBook Light IL2 is available from PIONEER Computers Australia on a build to order basis.